Educational Qualification : Passed/Final Year Appearing BE/B.Tech Degree in Concerned Engineering Discipline from any Recognized University. 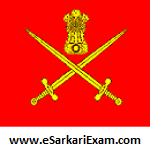 Eligible Candidates can Submit Application at the Official Website of Indian Army latest by 9th August 2018. Applicants First Logon to Indian Army Official Website. Open SSC Technical 23, 52 Course PDF Link at Home Page. Click on Apply Link in Officers Entry Section.